Sherida Stewart » Blog Archive » Do you LOVE Christmas? Get ready for a ranch-style holiday with CHRISTMAS WITH THE COWBOY! Do you LOVE Christmas? Get ready for a ranch-style holiday with CHRISTMAS WITH THE COWBOY! In honor of the newest Big Heart Ranch story, I’m serving Emma Maxwell Norman’s Chocolate Muffins with strong Arbuckle’s Ariosa cowboy coffee or a light peppermint tea. Please help yourself, as there’s plenty to go around. From my earlier reviews of Tina Radcliffe’s Big Heart Ranch series, you know I love the children’s home setting for these books. And now with her newest release, Christmas with the Cowboy, I’m singing carols and baking goodies, all in preparation for our special holiday. In this treasured story, we’re celebrating a ranch-style Christmas at the Holiday Roundup! OH! OH! OH! THIS STORY IS SO GOOD! Get ready for Christmas with this feel-good romance filled with the warm glow of the holiday spirit…children, snow and sparkling love. What can I say? I loved EVERYTHING about Christmas with the Cowboy. Hero Zach Norman is amazing…*sigh*…my kind of quiet, self-sacrificing guy. As a single mom to twins, Emma Maxwell Norman is hardworking as she takes care of everyone with her organizational skills. The fast pace of getting the ranch ready for the Holiday Roundup keeps the couple busy as they learn to put the past in perspective and trust their feelings for each other. Revisiting additional characters from previous books adds fun to the story. Lovable Dutch is a crusty, ol’ sweetheart. The two-year-old twins, Rachel and Elizabeth, are precious. The epilogue is Christmas perfection! Author Tina Radcliffe knows how to make a reader laugh and cry as the conversations sparkle with humor and emotion. I want to spend Christmas at Big Heart Ranch enjoying cookies and chocolate muffins! This is definitely a story I didn’t want to end…and fortunately there will be another Big Heart Ranch book. *I was given a copy of this book with no requirement to write a review. It is an honor to offer my honest opinion. 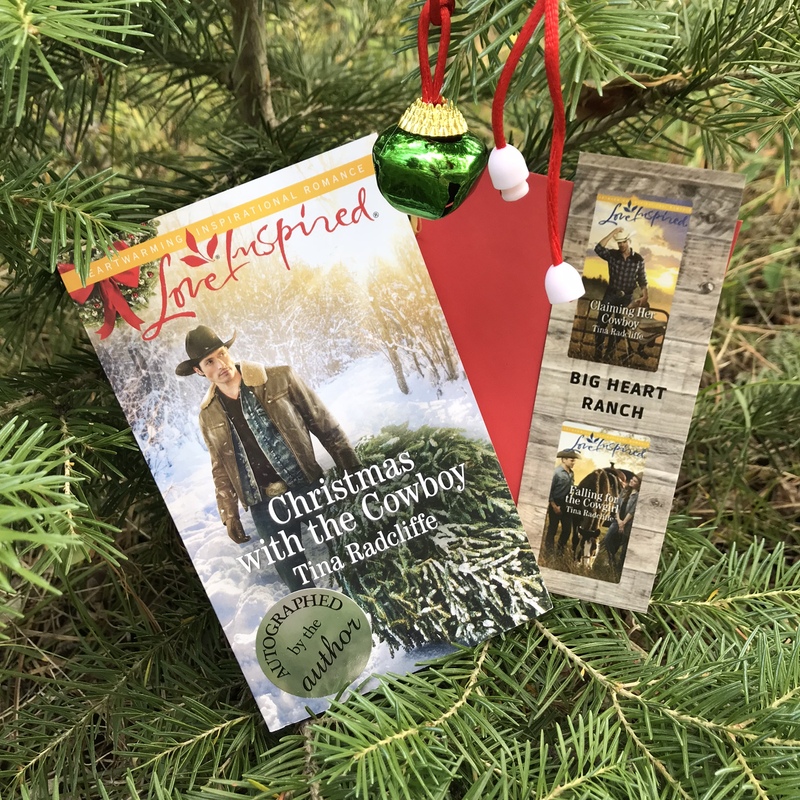 To get more information about one of my favorite authors, check out her website where you’ll find a place to order Christmas with the Cowboy and the precious books in the series, Claiming Her Cowboy and Falling for the Cowgirl. Also, I’d suggest signing up for her newsletters listed under the “Newsletters” tab. Time out with Tina is for readers, and the Writer’s Inside Edition has great information on publishing, contests and opportunities for writers. Please enjoy a muffin (these are SO good) and your choice of a mug of Arbuckle’s cowboy coffee or a cup of peppermint tea. 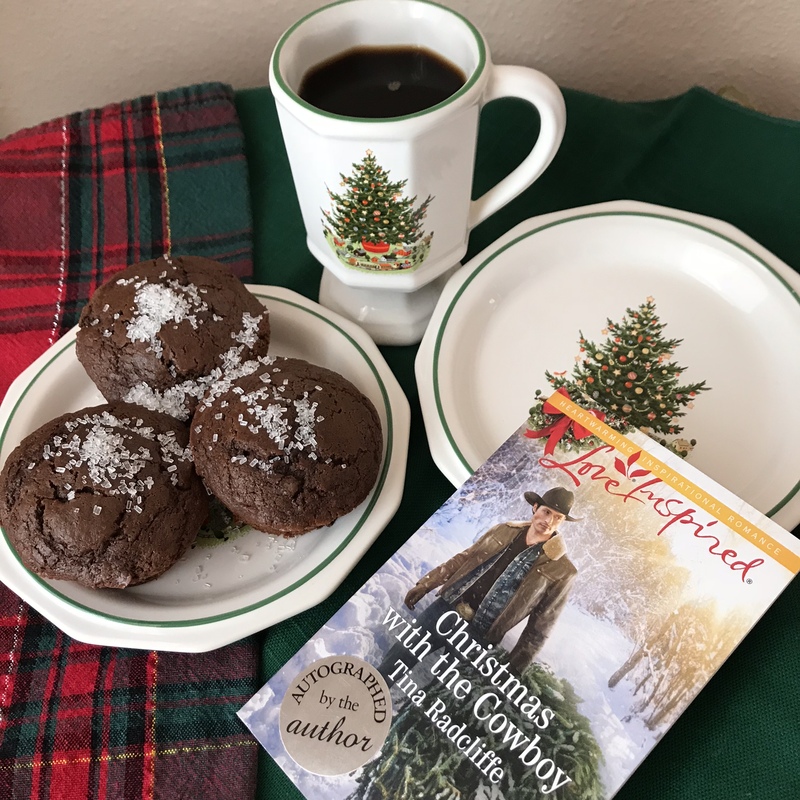 CHRISTMAS WITH THE COWBOY and chocolate muffins! Of course we need a recipe for the chocolate deliciousness, so Tina has posted this recipe. *Your comments are appreciated and will be posted after moderation. I apologize for delays. This entry was posted on Tuesday, September 18th, 2018 at 3:33 am	and is filed under books, Food and Treats. You can follow any responses to this entry through the RSS 2.0 feed. You can leave a response, or trackback from your own site. Pass the muffins! Thanks for helping me celebrate. Love all Tina Radcliffe’s work, but really looking forward to this one! Sounds like a great story, and I love that cover! Congratulations, Tina! Thank you, Laura!!! Looking forward to celebrating your book birthday too. And yes—that cover is amazing! Just got in from an appointment and glad to see those muffins—Yummy! Thank you so much for stopping by during your busy day, Patti Jo. You deserve extra muffins! I’m thinking of you and so excited for you! Hugs and blessings, my friend! What a delightful post, dear Sherida. Your muffins look ever so delicious and the book sounds wonderful! I don’t think I’m familiar with this author so I appreciate you sharing her work with us. Stephanie, how fun to have you visit Tuesday Tea! I’m a quiet guest at your sweet blog. We share the love of all things tea. Your teacup exchanges and delicious treats are delightful. Author Tina Radcliffe writes inspirational romance. You’d enjoy her Big Heart Ranch series…woven with faith. Blessings to you and thanks so much for stopping by. I’ll be baking your apple pie bars soon! Oh, I can’t wait to read it! This is such a great series. Tina is a wonderful author. Hope you have some left over tea and muffins. I’m so glad you visited today. Here’s a fresh batch of muffins just for you and a warm cup of tea. Enjoy these treats as you read Tina’s book. I KNOW you will love it! Blessings! Now I’m hungry for Christmas AND muffins! Exactly, Davalynn! We can never have too many muffins or too much Christmas! Thank you for stopping by for treats. Blessings to you! Christmas with the cowboy sounds awesome!! I’d love to have a signed copy!!! Are you blessed by LOVE? A #TuesdayTea February devotional with a review and giveaway! Are you blessed to “consider it pure” JOY? My #OneWord2019 #TuesdayTea devotional. Have you experienced UNEXPECTED blessings? #TuesdayTea December devotional. No computers were harmed in the 1.124 seconds it took to produce this page.